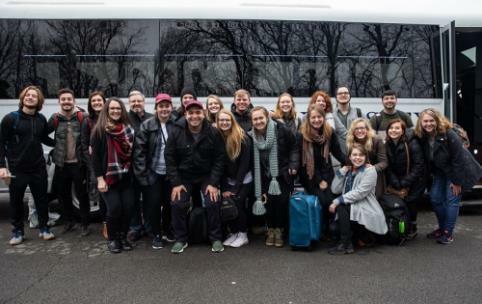 Lee Students Depart For Study Abroad Semester In U.K.
Twenty Lee University students departed for the annual United Kingdom Semester Study Abroad program. During the 12-week program, students will spend time in class at the University of Cambridge and travel throughout the U.K. This year’s trip director is Dr. Randy Wood, professor of humanities and chairperson for the Department of History, Political Science, and Humanities. While overseas, students will take 15 hours of courses, taught by Lee professors through a specifically-designed online program. This year, the courses will include The World of C.S. Lewis and Cross Cultural Experience, both taught by Dr. Matthew Melton; British Cinema, taught by Dr. Jeff Salyer; British Theatre, taught by Dr. Christine Williams; and For King, Queen, and Country: The Monarchy in British History, taught by Dr. Randy Wood. Outside of class, the students will travel throughout the U.K. In England, highlights will include visits to Windsor Castle, the home of C.S. Lewis, Harry Potter Studios, the Lake District, BBC Studios, and Hadrian’s Wall. The students will spend several days in the town of Bath, where they will be officially received by the mayor. During a long weekend in London, the students will see “Les Miserables” at the Globe Theatre, visit the Houses of Parliament, and attend worship at Westminster Abbey. While in Edinburgh, Scotland, students will have the chance to hike Arthur’s Seat, as well as explore castles and museums. During their March spring break, the students will travel to Ireland, where they will visit Galway and Dublin. The semester will conclude with a week of independently-arranged travel before the students meet in London on April 6 for their return to the U.S. During this week, students will arrange their own itineraries and accommodations in the countries that interest them most. In the past, students have traveled to Austria, France, Germany, Greece, Iceland, Italy, Poland, Spain, and many others. The students on this year’s trip include Joannah Beckler, Luke Benton, Mara Busch, Sarah Carson, Corey Dixon, Elizabeth Dusenberry, Sarah Anne Gabriel, William Hammond, Michael Hebron, Stephanie Iovescu, Gina Merson, Sarah Milliron, Sarah Mortenson, Randyl Music, Alana Pearce, Josue Roblero, Alexandra Squires, Megan Uhls, Reagan Vernon, and Joy Walker. For more information about Lee’s Global Perspectives program, call 614-8357 or visit www.globalperspectives.leeuniversity.edu.